Lucy Arlington is the nom de plume for the writing team of Ellery Adams and Sylvia May, two friends who collaborated on an idea that became A Novel Idea Mystery Series. 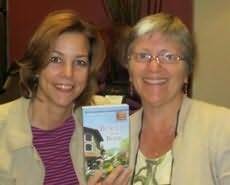 Both are authors in their own right; Ellery writes cozy mysteries and Sylvia womens fiction. "A spunky heroine, a furry side-kick with ‘cat-itude’, and plenty of southern charm. What more could readers want?" "A book cozy readers will be dying to check out."